If you hanker after the sound of uber-heavy metal guitars, but don’t have the guitar chops or the seven-string guitar to pull it off, then Three-Body Technology’s Heavier7String might be just the (virtual) session guitarist you are looking for. Built around over 10,000, 24-bit/48kHz samples (about 8GB in total), the plug-in provides a combination of a playable virtual guitar (yes, with seven strings) with lots of detailed performance options, a complete amp, cabinet and effects rack modelling suite, and a pattern preset system. The UI is suitably ‘metal’ in appearance and, while perhaps not the slickest (or easiest to read) virtual instrument interface I’ve encountered, it is packed with features. The bulk of the actual guitar sound is crafted within the comprehensive amp/cab/effects modelling section (and this is actually pretty good, going from super clean to super heavy), but the front panel also offers conventional guitar controls and a few extra options including the ability to adjust the string tension and resonance (to simulate the effect of different gauges of strings). You can, of course, also bypass the effects section and use your amp modelling plug-in of choice if you prefer. Oh, and the doubling option provides very addictive double-tracked guitar parts at the flick of a switch. There is a comprehensive selection of performance options, including control of strumming, vibrato style, how string bends are handled and sustain/palm-muting behaviour via the on-screen controls, and a range of key-switched performance controls mapped across the MIDI keys below A0. As well as playing lead lines, you can, of course, also trigger chords, and the plug-in has an excellent chord recognition system; if you want to play a fusion of metal and jazz (! 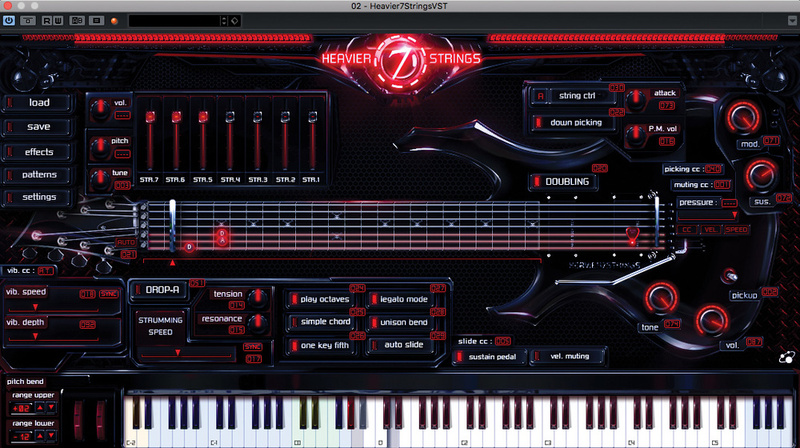 ), then H7S has the chords to cope. However, it also offers options for easy triggering of power chords and can turn simple three-note MIDI chords into full six-string guitar chords. There is a lot to get your head around here but, if you have the patience, it does enable you to coax a very realistic guitar performance from H7S via your MIDI keyboard or sequencer. Finally, the included pattern presets are well worth exploring. These are organised into style-based categories for easy auditioning, but the real insight comes from dragging and dropping them into your host to see just what MIDI data has been used to create them. And, once done, you can, of course, edit them as a starting point for your own guitar riffage. No, Heavier7String is not the prettiest virtual instrument I’ve used, and there are less expensive ‘heavy’ virtual guitars out there (for example, ShReddage IBZ), but it sounds great and can easily reproduce the super-heavy, super-tight chords and riffs that characterise modern metal styles. The instrument is perhaps beyond the casual purchase price but, if you want to try before you buy, Three-Body Technology very sensibly have a trial version available for download. It’s heavy!